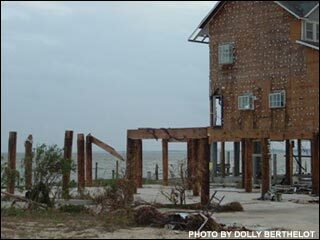 The storm surge that roared in with Hurricane Ivan was so fierce that even many non-waterfront homes in Pensacola flooded out. 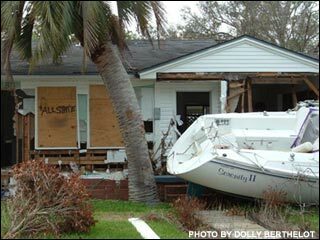 This Naval Point area home blocks from Bayou Grande was rammed by a cabin cruiser ironically named "Serenity II." Disasters make good memoirs! Have you, or your family, business, or organization survived major hurricanes, floods, ice storms, wildfires, volcanic eruptions, earthquakes, epidemics, or other ordeals by Ma Nature? Or catastrophes instigated by humans, from accidents to arson to terrorism? Was the event of historic magnitude, either to your community or region or to your own family or business or organization? Wouldn't you like your children, grandchildren, great grandchildren, employees, and others to know what "really happened," how the historic event impacted you and your family? Your neighbors? Your business? Maybe you lost everything or narrowly escaped with your life, or maybe you simply coped with incredible mess and stress, were hoodwinked by the unscrupulous, or marveled at the good that emerged under terrible conditions. Survival stories have psychological benefits, perhaps even spiritual benefits, whether you are lamenting your losses or counting your blessings—or both. And the future always benefits from true life stories of the past. Who will save them and share them, if not you? If not us? Hurricane Ivan destroyed or severely damaged 90% of the buildings on Pensacola Beach, a beautiful barrier island in the Gulf of Mexico. 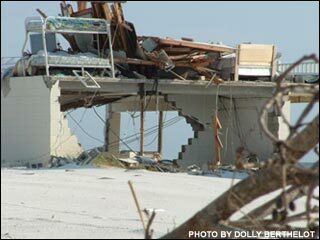 Beds still perch on the ruin of this gulffront home. Disasters, natural and otherwise, are likely to be an important part of your life experience, a milestone worth remembering and preserving. When the calamity is an extraordinary shared event, your experience becomes a vital part of our broader history, your unique perspective on a transformative shared event. You know it when it happens. 9-11 was It for our nation, at least since Pearl Harbor. Ivan the Terrible was It for Pensacola, the storm of the century in my corner of Northwest Florida. In 2004, four monster hurricanes bombarded Florida: Charley, Frances, Ivan, and Jeanne. The horrible tsunami that devastated parts of five countries put even Florida's disasters in perspective. But every region has its astounding storms of wind, water, or ice; or ruinous floods, raging wildfires, shocking earthquakes; or murderous slaughters. Every person is touched by turmoil and tragedy. Numerous fine waterfront homes were completely smashed or washed away. Only the pilings indicate the large house that stood here. A similar one just next door was probably gutted inside, some outer walls were ripped off, but it stands strong, against the odds. You are never quite the same. When the unthinkable happens, you, your family, your business, employees, or coworkers, your church, temple, or synagogue, your community, sometimes even your country is transformed. For years, decades, people will use the event as a "time gate," a historical marker. Did X happen before or after 9-11? Before or after the infamous 1998 ice storm of the Northeastern US and Quebec, the 1989 San Francisco earthquake, or hurricane Camille, which mutilated the Gulf Coast in 1969? The Sunshine State was battered by Charley, Frances, Ivan, and Jeanne within a few horrendous months—but the aftermath and recovery are ongoing challenges, continuing sagas. No doubt it is similar for survivors of the great Christmas season tsunami, which not only destroyed whole regions of five countries, but killed hundreds of thousands of human beings. Results of such upheavals continue to plague people. Efforts to rebuild broken homes and broken hearts persist long after the event itself leaves our TV screens. No one knows the real story unless you tell yours. Your memories can spread the truth. A lot is forgotten or never understood, unless a special effort is made to mine your memories™, craft them into lively stories, and pass them on in a form folks will appreciate listening to and/or reading. Sure, the mass media provides an onslaught of facts and tells numerous stories of such catastrophes, but that's for immediate use, not long-term preservation. Most importantly, that's not YOUR story. Any disaster that befalls your family, neighborhood, community, or nation is your story—but only if it's told from your perspective, out of your experience, and told vividly, so we can see, hear, taste, smell, and feel your experience. And whether the material becomes a short article or a whole book, whether it's for yourself, your family, or for a wider audience, you'll be glad you've provided an enticing, meaningful, enduring record that you and others can cherish long into the future. A professional writer and writing teacher can make sure the words are worthy of the historic event, worth reading now and for generations to come.